Need a rugged workhorse and fancy something with a little character? Try on the old Cherokee for size. You want rugged? You want practical? You want American? Then you need the original Jeep Cherokee, one of the first stabs at selling an all-American motor on this side of the Atlantic. Arriving in something of a blaze of publicity in the mid-nineties, the Cherokee’s design actually dated all the way back to 1984 – and boy did that show in certain places. Still, as a more affordable and less bulky alternative to the likes of the Land Rover Discovery or Toyota Land Cruiser it built up a sizeable fan base, something that continues to this day. You have to accept that the Cherokee (and we’re talking, technically, about the square-shaped 'XJ' model here) is going to be crude, noisy, slow and ill-handling compared to a modern SUV. Back when this car was designed, 4x4s were still expected to provide proper off-road ability – they were as much about camping trips and pulling up tree stumps as they were school runs and weekend shopping. Still, the XJ Cherokee is a relatively sensible size – think of it as a tall estate car – and so it’s far easier to thread through in-town traffic, and in and out of parking spaces, than many rivals, even modern ones. You sit up high in front of an upright windscreen and surrounded by glass with lots of slim pillars. Not great for the safety rating perhaps, but you sure do get a nice view out. (Just as well – the interior is dreadfully old-fashioned and cheap, although Jeep did try to upgrade it bit by bit in later years). Initially the Cherokee was launched with a choice of 4.0-litre straight-six petrol (smooth as butter and pretty quick too, but enormously thirsty), 2.5-litre four-cylinder petrol (noisy but a touch more sensible) and, eventually, a 2.5-litre diesel (really noisy but with half-decent economy). This being an American car, automatic gearbox options were available, but few Irish buyers took them up. Boot space is somewhat limited by the fact that the spare wheel, under a cover, lives back there, but you can get after-market kits that mount that on a hinged arm outside the boot door in order to free up a bit more space. On the reliability front, the engines are pretty strong as long as you keep them well serviced, but beware leaky air conditioning units, electrical gremlins, cracked rear leaf springs and you need to check the gearbox, differentials and axle hubs for oil leaks. Be very wary of any car that’s lived an obviously hard life down the farm or on a building site, as so often happens to old 4x4s when their prices start to fall. 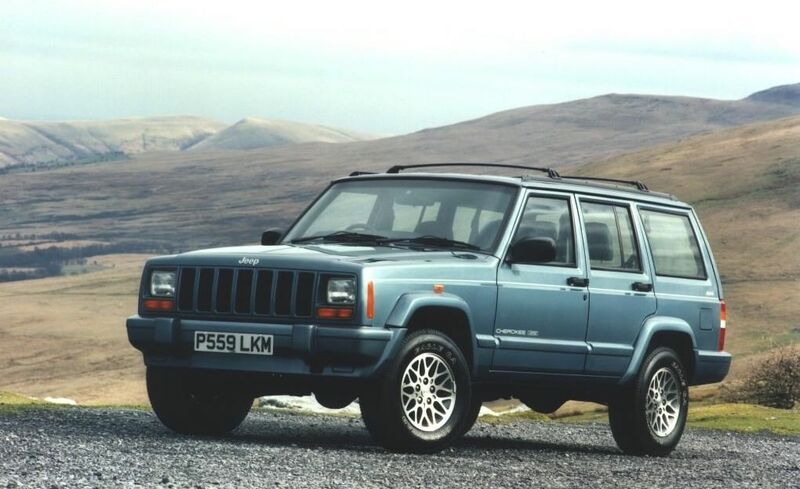 The second generation Cherokee, the KJ model, launched in 2002 (the one with the round headlights) was technically a more modern car, and had an improved 2.5-litre diesel bought in from Italy’s VM Motori, but it never quite won hearts like that original XJ and it was very unrefined to drive. However, it is more common on the ground than the increasingly rare XJ and can be bought for as little as €1,500. Make sure you get an automatic though, as the weight of the clutch is crippling.